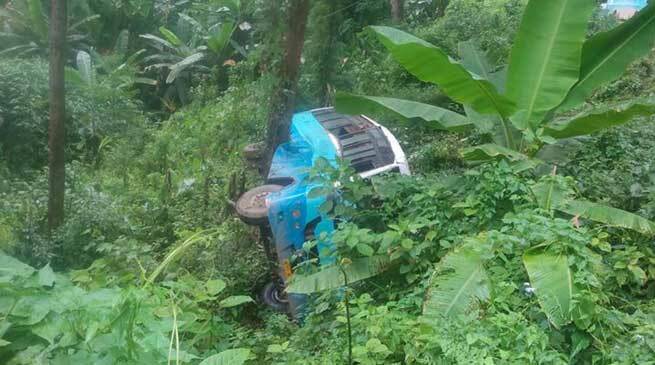 The Itanagar-Kamba bound night super bus carrying around 25 passengers met with accident sliding down the valley side near Pushi Doke village at around 3am on fateful night of 7th August last. Two passengers who sustained major injuries and others were rushed to Basar and Aalo General Hospital for treatment. Jumkar Karbi CO Bagra who rushed to the spot disclosed that the bus could have fallen deeper if not a tree at a distance of 8 mtrs beneath the road not caught strong hold of the sliding bus to avert more fatality. The actual cause of accident is not known.